You are here: Home / Risk Managment / What is Telemedicine? Telemedicine is the use of electronic communication, such as video calls, digital photography, instant messaging, telephone and email, to provide clinical services to patients, without an in-person patient visit. Some of the most common uses for telemedicine are follow-ups, medication management and remote specialist consultations. Telemedicine can be much more convenient for patients because of the ease of access and reduced time they must take out of their day for doctors appointments. 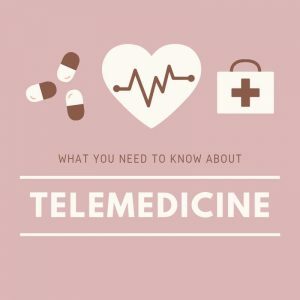 The popularity of telemedicine has risen greatly over the last decade with over half of all hospitals in the United States offering telemedicine in some capacity, and many specialized companies becoming prevalent, but telemedicine does not come without complications. The convenience that telemedicine brings also leads to concerns about quality of care. For many cases, a video call alone will not provide the doctor with enough information to properly diagnose the patient, so doctors must be knowledgeable enough to recognize when telemedicine alone will not be enough. One area of growth that the telemedicine industry saw in 2018 was the use of telemedicine in by companies like Hims and The Pill Club, companies that allow customers to get medication for birth control and erectile dysfunctyion, after an online survey. In situations like this, where a customer knows what they want and only needs to get a prescription, companies will most likely begin to adopt telemedicine. Some believe this is the direction that telemedicine is heading, instead of an overhaul where it replaces doctors office visits. There are numerous malpractice liability concerns that can arise from telemedicine due to location, data breaches, standard of care and incorrect diagnoses. As telemedicine becomes more common, doctors and insurance companies will have to find ways to mitigate these liability concerns by establishing clear guidelines and rules on how to conduct telemedicine visits. Currently, many professional liability policies do not include coverage for telemedicine, so doctors looking to begin practicing telemedicine should first make sure that they are covered to do so or look to add to their coverage. Laws regarding prescribing medicine and practicing across state lines vary as well. Many states restrict all prescribing, while others allow it for established patients or for limit-controlled prescriptions. A doctor treating a patient across state lines will most likely need to have a license in the patient’s state in order to treat them. To begin a telemedicine practice, doctors must first familiarize themselves with telemedicine laws in their state of business. Telemedicine laws vary greatly in different states, so confirming which laws apply to your state is necessary. For example, certain states require doctors to establish care in-person, while others allow doctors to treat a patient for the first time over a video call.